MANHATTAN — Trains along six subway lines were disrupted for Friday morning's rush-hour commute because of a power outage near Chambers Street, the MTA said. The Friday outage began about 7 a.m. and was resolved about 90 minutes later, according to an MTA spokeswoman. Some trains were briefly rerouted along other lines but returned to their normal routes once the issue was resolved, the MTA said. However, trains along the A, C, E, F, M and R lines were all reporting delays, the MTA said. "It was ridiculous today. It was some nonsense. I didn't think I was ever going to get here. I'm 38 minutes late for work," said Simone White, who commuted from the Barclays Center to the Seventh Ave-53rd Street subway station. "The ride was really long and really crazy. All they would say is, 'There's train traffic.' They need to get it together," she added. 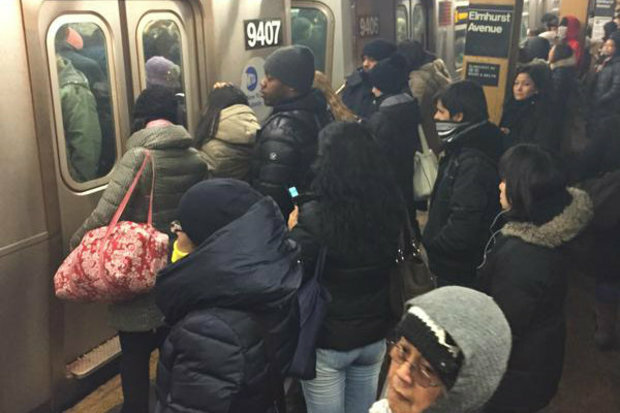 Other commuters reported packed platforms along the affected subway lines. "I felt helpless. It was terrible. We just sat at Flushing, Greenpoint, Nassau and you could barely move on the platforms. It was worse than Times Square on New Year's Eve," said Lynnore Thames, 48, who took the G to Court Square and waited to transfer to the E train. Frustrated commuters vented their anger on social media. Hope the MTA will tell my professor why I'm late to class even though I left my house 2 hours before my class starts . Love sitting underground for 90 minutes and missing my morning workout @RefineMethod because of the #MTA. Can't wait for the fare hike! Riders should check the MTA's website for updates.